Facts about Society Garlic plant. "Scientific name for Society Garlic plant is Tulbaghia violacea". Society Garlic plant is an ornamental plant commonly found in South Africa. The leaves of Society Garlic plant have a garlicky flavor. Just like the ordinary onions, it belongs to the lily family although defer in the genus classification. The Society Garlic plant is native and restricted to Africa. It has about 24 species all from the genus Tulbaghia. Some of the species are named after the physical appearance and color of the plant. For instance, the species violacea is named so because of the color of its flower which is violet or at times purplish-violet. The name society garlic is derived from the clump forming behavior of the plant and the garlic smelling nature of its leaves. Every plant has around 5 to 6 leaves which are 1/2 inch (1.2 cm) wide and one foot (30 cm) long. Whenever the society garlic plants grow together, they give the impression of a much larger plant. The color of the leaves is grayish-green but it changes with the species under observation. A leafless stalk which measures between one and two feet (30 to 60 cm) tall can hold anything between 7 to 20 flowers above its foliage. Compared to those of regular garlic, the flowers of Society Garlic plant are showier. The blooms assume an urn shape that measures about 1 inch in length. The Society Garlic plant can be grown throughout the year in outdoor set ups. 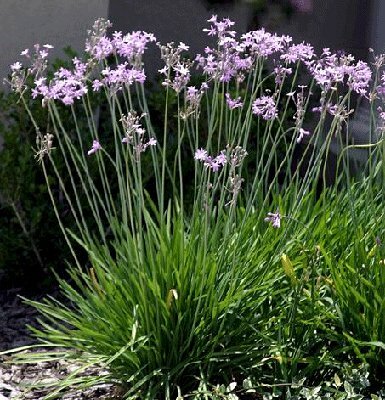 As opposed to other plants, the Society Garlic plant can tolerate the summer heat and often blooms for months. Research has shown that these plants do well in sunny and light conditions. Temperatures below 25 degrees F (-3.8 cel) can be harmful for this plant especially concerning its foliage. In the Northern hemisphere, gardeners usually pot the Society Garlic plant thereby enabling it to be transferred in and out during the different seasons. During summer, the Society Garlic plant is moved outdoors while in the winter season it is brought indoors. An alternative way is to transplant them into the ground during summer and as fall sets in, you repot them. The bloom period usually last between July and September.